Whilst a certain level of supervision is mandatory, do ensure that, as your practice grows, your supervision hours reflect your increased case load. BACP accredited therapists are expected to have a minimum of one and a half hours of personal supervision per month for those months that they are seeing clients. Therapists who are not accredited would be wise to use this as a minimum yardstick for their own supervision. Do reflect yourself on your personal needs, and increase your supervision where necessary. 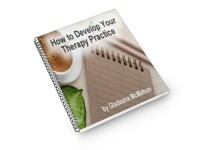 There are special arguments for the use of supervision for therapists in private practice. Private Practice is, in a sense, an isolated occupation. Unlike working within a counselling agency or organisation, where you’ll usually have constant opportunities for dialogue, peer supervision, theoretical discussions and an awareness of practise methods of others. You may have one-to-one and/or group supervision provided by the service whereas working alone means that, where you wish to provide yourself with such opportunities you need to be pro-active in arranging both formal and informal supervision arrangements. Don’t neglect this important area of your practice. Personal therapy is really just that. As an experienced practitioner, you’ll be aware of the help it can give you, and how often you need this assistance. It is not mandatory, so it is a purely personal decision. However, many therapists who found personal therapy helpful in training, continue with the same therapist once they have qualified. Provided this suits you, simply continue in this way. However, there is an argument to say that, where personal therapy is also a professional development tool, changing therapists from time to time gives a broader view of different approaches from both a theoretical and personal view. You may wish to consider the benefits of this approach.